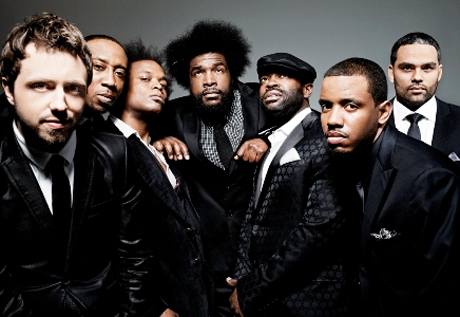 Hip-hop has its share of prolific musicians, but even Lil Wayne and Kanye West must be impressed by the Roots' tireless work ethic. In addition to performing as the house band on Late Night with Jimmy Fallon, the group recently released a new album, along with a covers collaboration with John Legend. Now, the group have unveiled yet another new project: composing the score for the film Night Catches Us. HipHopDX reports that the Roots' own Black Thought appears in the film, which is a romantic drama set in the band's hometown of Philidelphia. According to IMDB, Black Thought plays a character named Bostic Washington. The film premiered at the Sundance Film Festival earlier this year and received a limited release on December 3. While IMDD doesn't list the Roots in the credits, The Morning Call reports that the group "provided the soul-drenched score." The film is set in 1976 and stars Anthony Mackie and Kerry Washington. See a trailer -- which confirms the film has "music by the Roots" -- below, and pay special attention to music playing in the background, much of which was presumably composed by the Roots.